Very well planned week. I was never bored, facilities were excellent, we were looked after very well. TMT UK Ltd now delivering Basic Life Support, AED and Anaphylaxis training for the NHS. Our teambuilding day was fun and challenging. The facilitator was able to put us all at ease. I personally gained fresh confidence and really bonded with all my colleagues. The original founder of TMT is David Brassington, a highly experienced and versatile manager and trainer, committed to ensuring own practice consistently meets Industry and Organisational quality operating procedures. After a successful career in the Royal Air Force, employed in several areas from Air-Defence and Training to Project Management, David quickly learned the benefits of detailed planning and effective man management whilst serving across the world in difficult environments. After numerous courses ouside the RAF David saw that there was a place in the market for a first aid training company that cared about the quality of its training. A company that not only employs trainers and consultants that are experts in their field, with a passion to pass on their skills to others, but want to make a difference. David quoted 'I was surprised by the attitude of some training companies, they did not talk about the transfer of training, culture and ethos, surely the main reason for training is to improve life and work skills and then be able to transfer that into the workplace". Since TMT was first formed in January 2006 the growth has been beyond all expectations, now delivering courses all over the UK and at any time of the day. To the best of our knowledge no other training company offers this service. The number of courses on offer has grown ten fold and our customer base is now very impressive. TMT now offers training, team building activities, consultancy and fire extinguisher service and installation. The company has now moved into its own offices and is delivering four day residential courses to major clients. What Is The Future For TMT UK Ltd? TMT is aware that in the modern, fast changing market place, business success is determined by the organisations ability to learn, adapt and create. TMT aim to become a one stop shop for training, a company that cannot only be relied upon to deliver the goods at any time, but to a standard only delivered by TMT. We will build on our position in the training sphere, explore new opportunites and strive to be the best we can. 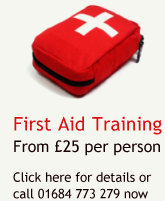 TMT UK Ltd will be delivering Schools and Sports first aid courses. Both courses can be tailored to meet your individual needs.